While some tools are relatively new to the molecular gastronomy bag of tricks, modern chefs also rely on time-tested methods like the sous vide water bath. At its heart, molecular gastronomy is about taking “traditional” components and dishes and re-imagining them to alter the tastes, textures and smells we commonly know. And sous vide sure fits the bill. As we detailed last week, water ovens are gaining in popularity among home cooks, and for good reason. 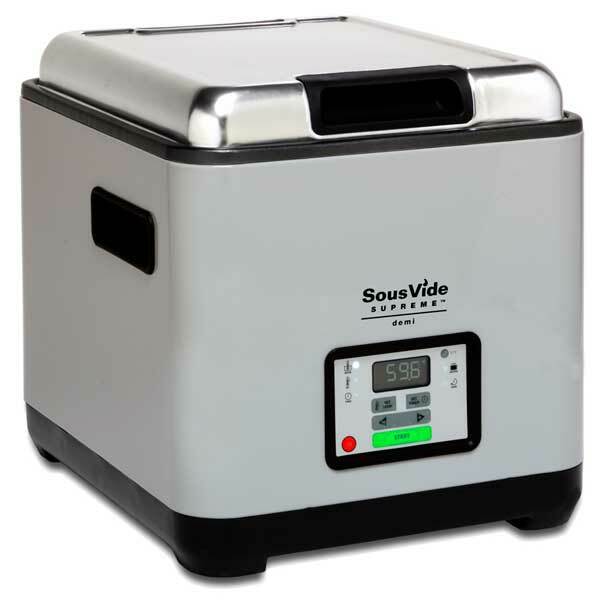 The sous vide (under vacuum, from French) method utilizes a water bath which leaves a juicy, delicious end product that, in contrast with boiling, roasting or pan-frying, traps in essential vitamins (and natural flavors), leaving you with a healthier dish, too. The sous vide method is fairly easy to understand and to utilize, with the proper equipment. It also offers more control than a standard oven, because sous vide ovens are set to the exact temperature you want the food to reach (146°F for chicken, 134°F for beef, and so on). The food is cooked at this relatively low temperature for a long period of time. 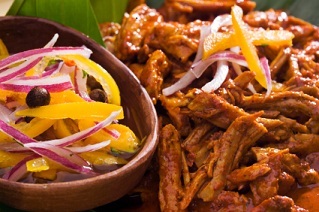 The outside cooks to the right temperature and then just stops cooking – it can’t get hotter than the water around it. The inside then has time to “catch up” in temperature and doneness. You end up with a very consistent cut of meat. That’s only half the story, though. We all love the smells that emerge from the oven as our food cooks, the gently wafting aromas floating us into our noses and reminding of the meal we are about to receive. But – we’ll try to break this gently – those aromas are bad news. That’s flavor and nutrition being pushed off into the atmosphere instead of into your mouth. Not so with sous vide. Remember those vacuum sealed bags? Obviously they’re there to keep the water out. But they also keep the flavor – and the juices and the nutrients and the vitamins – in. You won’t be able to smell while it’s cooking, but you’ll get a finished product with a lot more taste, juiciness, and nutrition in the trade-off. That’s not a bad deal, if you ask us. Sous vide has a long history – it dates back to at least 1799 – but it was rarely used until the 1960’s. In the last ten or so years, as professional chefs have begun to take advantage of the progress science has made in the field, they’ve really started to gain steam (pun intended). At first glance, it’s easy to dismiss sous vide as merely “bagging and boiling”. It can more accurately be described as a controlled method of poaching, although that description doesn’t quite do it justice either. There are a number of variables that take this method of cooking down a new and (for some) peculiar culinary path. Home chefs can now coax simple fruits into condensed versions of their former selves. Take the simple watermelon, as in this story from the New York Times covering the re-emergence of the sous vide a few years ago. By compressing the fruit, and with it, the cellular structure that makes up what we commonly know as the watermelon, the chef can create a concentrated flavor AND re-imagined texture. For the carnivores among us, the accurate control of the sous vide water bath allows the user to cook a perfect cut every single time. The low temperature is enough to break down the collagen that makes the meat tough, but not hot enough to break down cellular walls in the meat itself, leaving a succulent texture and preserving the juices. Similarly, as vegetables are cooked in water below the boiling point, they can be cooked through without losing their complete cell structure, which means they come out crisp but cooked, rather than mushy and uninspiring. An (optional) final step to cooking sous vide is to sear the protein right after removing it from the bath. The higher heat produces something known as the Maillard Reaction, which occurs when denatured proteins on the surface of the meat recombine with the sugars already present. This leaves the final product with the characteristic “meaty” flavor so familiar to our palate. Not to worry vegetarians… it happens when you bake bread, too! If you’re interested in learning more about the science side of sous vide, check out this guide by Dr. Douglas Baldwin of Colorado State University, who has also published a wide-ranging look into this culinary art. Ready to try sous vide? Stop by the store this Saturday – we’ll be showing off this awesome machine from 11-3. On the menu: Bacon Fat Poached Pork Tenderloin and Spiced Apples Sous Vide. You won’t want to miss it!